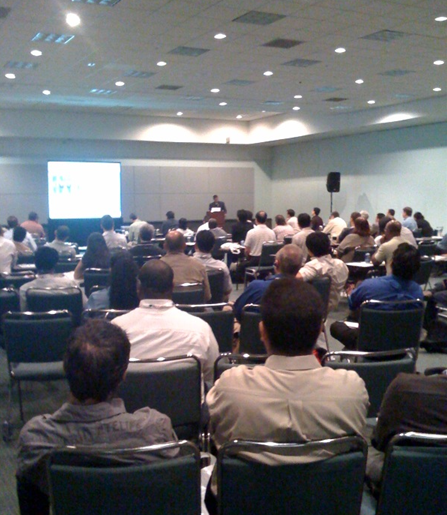 SIP trunking technology offered some of the most intense and well-attended sessions at TMC’s premiere IP telephony event (just look at a photo I snapped, below, if you don’t believe me) in September – and we’re expecting the same at the fast-approaching Internet Telephony Conference & Expo, being held from Feb. 2 to 4 in Miami. Like many other telecom technologies, SIP trunking stands to gain traction in this slower economy for its cost-saving capability. For those of you who don’t know, in a word, SIP or “Session Initiation Protocol” trunking is a service that VoIP service providers offer that allows businesses to adopt IP telephony using the same connection as the Internet connection. SIP trunking allows users to remain in touch with others who may still get their service on a PSTN, since the enterprise IP-PBX is connected to the SP’s PSTN gateways through the Internet. One of the most hotly anticipated sessions of next month’s ITEXPO is “Introduction to SIP Trunking,” to be held from 10 to 11 a.m. on Monday, Feb. 2. 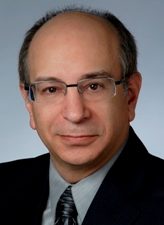 And one of the experts who will be speaking during the session is a 25-year veteran of telecom, BandTel Senior Vice President of Sales and Marketing Joel Maloff. Los Angeles-based Bandtel prides itself on leveraging the latest technology with cost-effective SIP trunking solutions, and features made available through the company’s solutions include: Outbound Domestic and International Long Distance Voice Services; Direct Inward Dial; and Domestic and International Toll-Free Services. In a recent interview (printed in full below) Maloff, who also will co-host a session titled “The Service Provider Perspective,” told me that one of his major goals as a speaker is to make technology understandable and avoid using buzzwords. I think he’ll be great – personally, I find him engaging and self-effacing. Joel Maloff (pictured left): Surprisingly for someone who has spent the last 25 years in entrepreneurial telecom and Internet, the greatest influence on my career came from the Bell System as a whole. It taught me how to analyze strategically, consider such obscure issues as “cross elasticity” in pricing, how do a network engineering analysis manually using CCS calculations, how to look at competition strategically, and what to avoid if you intended to stay ahead of the curve. Despite having started with Ma Bell, the valuable lessons have stayed with me throughout my subsequent career. JM: The most exciting aspect of our industry to me is what we have yet to discover. We are continually developing new technologies and concepts. Some succeed whereas others fail. Some concepts may have been premature in terms of perfomance or cost but will succeed in adoption at a later time. As a community, we must understand that the value of what we bring to the table cannot be defined in terms of obscure buzzwords but rather from the value that businesses and consumers can derive. Finding ways to communicate this in a clear and unambiguous manner, especially when economic conditions demand innovation that will reduce costs and increase value, is an incredibly exciting challenge. This is a trick question. I wish I had more energy, attention span, and resources! The fact of the matter however, is that we must “play the cards that are dealt to us.” If I had an unlimited supply of these attributes, I would have much greater market analysis, much better understanding of the global implications of information systems and communications technology, the ability to tailor products and services to specific global regions, and invest much more effort in targeted “educational” sales and marketing opportunities. 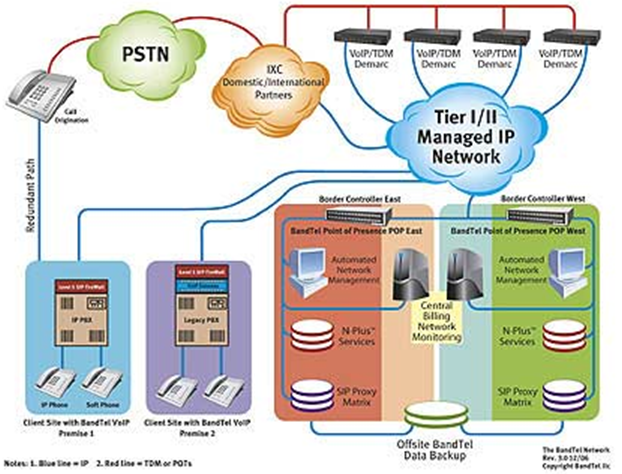 JM: BandTel is a provider of PURE SIP trunking services. We do not provide hosted IP PBX services but rather are interoperable with most premise-based IP PBX systems as well as legacy telecom systems. We help enterprises and resellers understand how SIP trunking can reduce costs and expand reach without a major and expensive overhaul of telecommunications. These contribute strongly to an enhanced bottom line and significant ROI from implementing SIP trunking. JM: BandTel was founded in 2004 as a provider of SIP trunking services. Although we have a variety of services that offer SIP trunking in different flavors, we have stayed true to our mission, and having built our own infratructure, have one of the most mature SIP trunking environments in the world today. Our vision is to continue to be solution-driven by our customers rather than solely technology-driven. RT: If you were forced to head Nokia, Google, Yahoo, Microsoft, GM, Cisco or the United States, which would you pick and why? JM: This is an intriguing question. Let me start my answer by ruling out some of the candidates. Nortel? No, it’s hard to lead a giant out of bankruptcy with 100 years of legacy. Not impossible but just not appealing. GM? Same answer (Oops - don’t think they have filed for bankruptcy yet). Google, Yahoo, Microsoft, and Cisco are all interesting possibilities, and all have shown a tendency - to varying degrees - for innovative out of the box thinking. Of these, Google and Cisco are most appealing. The US has so much promise but the next ten years have the potential to be traumatic on many fronts - economic, military, civil. I am not sure that anyone is really qualified to head the USA, but I know it is not me! That leaves Nokia. Mobile devices and communications have evolved considerably during the last twenty years. What is in store for us in the next twenty years? Science fiction today may become tomorrow’s reality with implantable devices that do away with the incredibly shrinking mobile phone/computer/PDA. That could be a fascinating ride! JM: Technology for the sake of technology is a mistake. Technology designed to foster innovation within the United States and worldwide is critical. In the 1980’s, the U.S. government sponsored a program to create supercomputer centers as a response to the consolidated research done in Japan and sponsored by their government. Rather than each company sponsoring its own research in competition with one another, they combined R&D efforts and then after sharing that research among their businesses, competed with one another in marketing. Our supercomputer center effort led to the creation of the NSFNET backbone and ultimately what we know today as the Internet. The creation of such joint R&D efforts, open to all, are mirrored by the IETF today. Federal leadership in fostering such new efforts would be invaluable. Soliciting participation from other governments would be even better. JM: Before the communications industry proceeds with requesting the business equivalent of welfare, every enterprise needs to take a hard look at their books, and determine how to function efficiently and effectively. Why do we want to reward bad management? Rather, we need to incent good management. For companies that can demonstrate that they are making the right decisions but need capital infusion to jump to the next level, create more jobs, introduce innovations, and contribute to the economy, a new look at Federal grants and low or no-cost loans could be considered. That is not a bail-out. It is an incentive to do what should have been done previously but with a LITTLE help rather than a total bail-out. JM: Using resources wisely should always be important. Why consume resources without regard for their limitations or their costs? The green movement is good for business and good for the environment. JM: SIP trunking gives businesses the ability to do exactly what they do today in terms of local telephone numbers and inbound and outbound telephone calls, but it does it for less cost and with greater functionality. Businesses of all sizes have the ability to save from 20 to 70 percent when compared to their status quo. In a recession, saving thousands to millions of dollars per year without compromising quality is an area that must be explored. In some instances, this could make the difference between red ink and black ink. JM: Part of my mission is to make technology understandable and avoid falling into too many buzzwords that do not matter to most business executives. During my presentations, I try to deliver material that will be useful to all parts of the audience, and to listen/respond to questions directly so that I can be as helpful as possible.